What is SmartCat Sky Climber for Cats? The SmartCat Sky Climber for Cats is a durable scratching post and shelf covered with sisal material that you can hang on the wall. Cats love to sit and watch their surroundings, and the SmartCat Sky Climber for Cats allows for just that. With a wood base and short tower, the SmartCat Sky Climber for Cats can be placed anywhere on your wall, depending on your cat's jumping ability. Once your cat is settled onto the SmartCat Sky Climber for Cats he or she can nap, perch, or scratch away in comfort. Cats love to be up high and watching those pesky humans. Plus, they love to scratch. The SmartCat Sky Climber for Cats allows your cat to do both in the comfort of your home. The tower design is perfect for cats that love to stretch and scratch, and the large platform allows cats to jump up and watch the world go by. All you have to do is securely attach it to the wall of your choosing. Replace if any damage is noticed. Pick out a spot on the wall your cat may like to jump to the most. 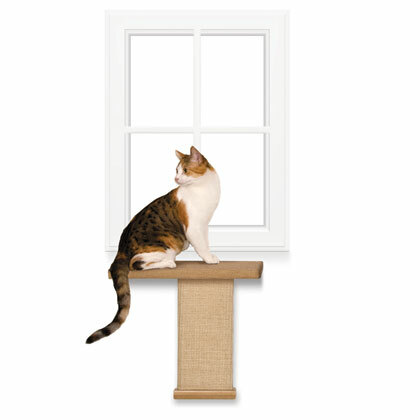 Attach the base securely to your wall and show your cat his or her new perching area. Place the Sky Climber underneath a window for maximum enjoyment. If you are purchasing for multiple cats, make sure to space each unit out accordingly to reduce territory fights. Wooden post covered in durable woven sisal material. Wooden base attaches securely to your wall.